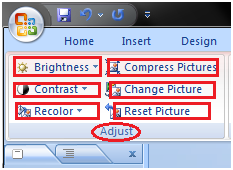 The Adjust group displays six commands. The Picture Styles group displays picture styles and three commands. Align: To align the multiple pictures on the slide. You can distribute them evenly across the slide. The Size group has three commands.